I was sent this article from Sigourney at Batavia Coast Dive & Watersports in Geraldton, Western Australia, I thought I would share this with you as she puts in writing what so many of us think and feel. Thanks for the well written story Sigourney! I live a dream. What I do as a PADI Scuba Diving Instructor is more than just a job to me, it is my lifestyle. My life is teaching others how to become a PADI diver, showing them that they can breathe underwater and introducing them to a whole new world. Diving has whole-heartedly transformed my life. The instant your head is submerged, you’ve infiltrated a unique environment filled with unimaginable wildlife. In that moment, I chose to pursue a profession in diving. I didn’t care what I had to do to get there, but I knew I would and now here I am intoxicated by the aquatic habitat. As an Instructor, I know how my students are feeling; anxious, fearful, enthusiastic, happy or all of the above. I was definitely perplexed at the beauty that existed by my doorstep. Nothing can compare to the first breaths you take underwater, enveloped by a wall of fish and coral. Today, I get to instruct, refine skills and certify people who adopt the idea that diving can provide them with a sense of content. To me, diving awakens your core; reposes you and sedates your mind. Everybody has a story. Everyone has sacrificed something to get to where they are today. Every journey has potholes and speed bumps, roadblocks and curves. It’s what you choose to make of those obstacles that introduce themselves unexpectedly into your life and how you opt to overcome them. The anxiety of an obscured path will always be there. Diving inspired me to conquer timidity and morphed me into the person I am today. Presently I am living the life I once thought unachievable. Diving has led me to conclude that any dream, no matter how sizable is attainable. Being a PADI Scuba Diving Instructor is not my job, it’s my life. One thing that I have learned is that there is no such thing as a “typical day” in diving. There is always something new to discover, to do, to see and new people to meet. This is what makes diving and working in the dive industry as a PADI Divemaster so interesting. If I had to describe a “typical day” though, it would be the Club dives. I run some of the free club dives that Perth Scuba organise every Sunday morning (day dive) and Wednesday nights (night dives). It involves choosing a dive site that would be appropriate for new divers while keeping things interesting for seasoned divers. We prepare a schedule so that the dive sites are not the same every week – then later weather conditions are taken into account to decide where we will actually be going. On Sunday mornings, we start at the shop bright and early, preparing the free barbeque for all our Manta Club divers. This gives everyone a chance to socialize while we eat breakfast and to provide all divers with a pre briefing of where we’re going for the day, along with maps of the dive site and directions. At the site – with everyone ready – we carry out a proper briefing pointing out interesting features and covering all the important safety points. Considering their diving experience, divers are paired with an appropriate buddy. Pictures of all our divers are always taken for our blog that I prepare at the end of the day. When the dive is over, I make sure that everyone is safely out of the water and all divers log books are signed. I am originally from a small island east of Madagascar called Mauritius. Being born on a tropical island, I always liked the water and always wanted to dive. 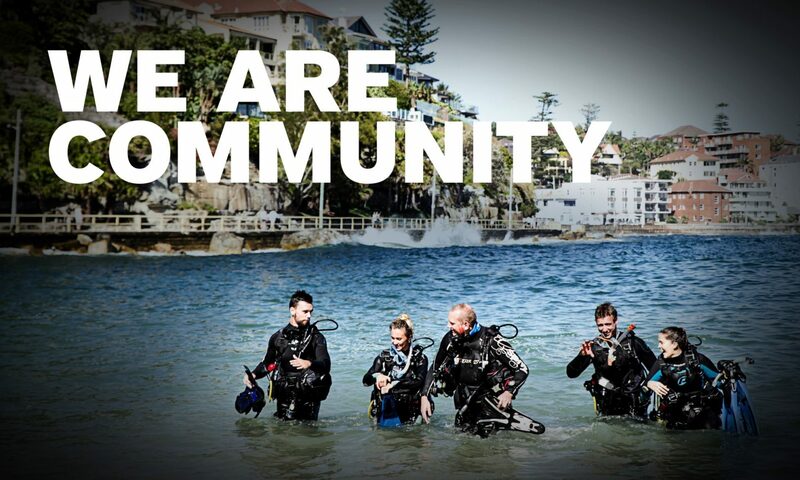 I was able to start this activity after moving to Perth, Australia and completed the PADI Open Water Course in December 2013. In the past 6 months, I have logged over 100 dives, diving in different countries and in different conditions, from the 12 degrees of the lakes in Houston, Texas, USA to the 26 degrees in Perth, the differences in dive conditions are quite amazing. Where else to become a PADI Divemaster – if it is not where I did my Open Water? Perth of course! With all the great support from the Perth Scuba staff, the PADI Divemaster course was made enjoyable and fun to do. I completed my DM course in April 2014 and have now scheduled to do a tech course. I found diving to be extremely fun and wanted to share this experience with as many people as possible. Becoming a PADI Professional means that I get to show more people dive sites and help more people discover the amazing world of diving. Helping students who are having issues – and seeing the student succeed, is probably one of the most rewarding feelings and the highlight for me. I have always been fascinated by penetration dives and history. So the many historic WW1 and WW11 wrecks of “Scapa Flow” come to mind – well preserved by the cold water off the north coast of Scotland. Another interesting site is the “Lost city of Shi Cheng” in China where an entire ancient city was submerged when a dam was built. Diving in Dunsborough on the HMAS Swan wreck – while at the bottom at around 31 meters – and still being able to see the surface! Experiencing the sight of this huge wreck at the bottom of the seabed was breathtaking! If you like to meet people and help them, while having fun in the process – becoming a PADI Divemaster will give you that! The latest A Day in the Life of a Divemaster features Feby N. Rotty who gives interesting insights from a Divemaster’s perspective. What is your current job at Joe’s Gone Diving? I’ve worked there as a Divemaster since February 2012. A typical day begins at the dive centre at 7 o’clock in the morning to prepare the trip for the day, pack equipment and greet the guests. Some guests arrive in the morning at the dive centre, others I pick up on the way to the dive site. The dive area is usually different every day. I organise all the guests with their equipment on the dive site, give dive briefings and decide which dive site is best depending on the conditions. During the dive I try to show as much interesting marine life as possible and make sure they have a great time and dive safely. When we return to the shop we fill in logbooks and chat about all the things we saw. I started diving in 2007 with Poli Teknik College in Manado, North Sulawesi. They offer a special programme called Underwater Eco Tourism. I got my Open Water certificate in 2008. My instructor there was Frans Rattu. I studied for divemaster at the Poli Teknik College and did my divemaster internship at Kawanua Dive Centre in Manado, North Sulawesi in September 2011. After finishing my internship I felt very fortunate to have made the first step of my dive career, something I never thought was possible before. Once I had to demonstrate clearing a fully flooded mask in open water. Because I was nervous I needed two attempts to get all the water out. The student did not notice but my instructor briefly held his hand in front of his face to let me know what he saw. We had a good laugh afterwards and it was a nice learning experience. I started working as a Divemaster at Bastianos Dive Resort in Bunaken, North Sulawesi. After 9 months I moved to Bali where I have been working for Joe’s Gone Diving since my arrival. Around Bali there are some dive sites with widely varying conditions. One famous dive site is Gili Mimpang just off the coast of Candidasa. My first few dives there were in calm conditions but one day changing currents made it difficult to keep the group together. In the end I managed and with the currents attracting lots of beautiful marine life such as white-tip reef sharks, trevallies and tuna – it was one of my best dives ever. Apart from technical skills I believe social interaction with customers is key to being a successful dive professional. Whenever friends and others talk about becoming a Divemaster I tell them about these basics so they know what to expect.